The bath is heated with by a powerful 550W heater, allowing for quick temperature adjustment . A hydraulic termostat ensures accurate temperature control. Heating is indicated by a pilot light on the front panel. Variable temperature 6 liter mini Water Bath is designed for molecular biology, biochemistry, tissue culture microbiology and serology applications. Its small footprint and compact design make it ideal for personal use, small labs and classrooms. For a long life and easy clean-up, the seamless chamber is constructed of corrosion resistant steel. the included gable cover helps to retain heat in the bath, limit evaporation and is required for higher temperatures. A magnetic stainless steel clip is provided for suspending a thermometer from any location around the primeter of the bath or through a cut-out in the gable cover. The optional non-toxic (non-mercury) thermometer clips onto the gable cover for accurate temperature monitoring. 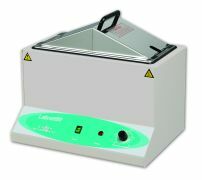 The chamber accommodates plastic tube racks such as the Labnet K564, K565, K566 and S2058-30 up to three 250 ml Erlenmeyer flasks.